Glue case erectors are designed to erect cases from pre-scored folded-flat blank corrugate and to close and seal the bottom of the case with glue. The glue case erectors form the case, fold the bottom minor flaps, apply the glue to either the folded minor flaps or the unfolded major flaps, and close the major flaps. The glue sealed major flaps are often compressed for a short period of time to allow the glue to set up resulting in a stronger seal. Pearson, Model CE35-T, automatic, case erector and hot melt bottom glue sealer. Rated from 10 to 30 cases per minute – depending on materials, application and machine configuration. Case size range: 8¾" to 23½" in Length; 5" to 16" in Width, 5¾" to 18½" in Depth. Pearson, Model CE35-G, automatic, right to left, case erector and hot melt glue bottom sealer. Rated from 5 to 30 cases per minute – depending on materials and application. Case size range:10" to 20" in Length; 5" to 16" in Width, 8" to 16" in Depth. Equipped with 58" long x 19" wide (4) chain automatic blank case magazine, suction cup pic n place and case erecting, squaring system with top hold down and 48" long choke feed transfer. Hand crank height and width adjustable case feed section, top flap lifters and rear flap closers and plows, Nordson hot melt glue system with single ram arm compression section. Control panel has A/B PanelView Plus 600 touch screen controller with push button start / stop / E-stop push button controls and statis light bar. Mounted on heavy duty base frame with interlock safety guarding. Bemis Model 1516, automatic case erector and bottom hot melt glue sealer for RSC and HSC. Case size range: 7 to 24" in Length; 5" to 16" in Width; 4 to 16" in Depth RSC (7 to 24" in Depth HSC). Equipped with blank case magazine, vacuum suction cup reciprocating pic n place and case erector, hot melt glue system, major / minor flap closers, ram compression section and case discharge. Speed dependant on materials, application and machine configuration. ABC Model 500, automatic, continuous motion, hot glue, case erector and bottom sealer, rated from 20 to 55 cases per minute – speeds depending on materials and application. Knock down case size: 14-1/4" to 29-3/4" in Length; 12-1/4" to 26" in Width. Equipped with a 32" long blank case magazine, reciprocating vacuum pick and place, lugged chain carrier system set on 32" centers, top squaring conveyor, minor and major flap closers, two compressing rams, hot melt glue system, and interlocking Lexan guarding. Padlocker Model CF 209 XL case erector bottom sealer hot melt capable of doing from 5 to 15 cases per minute – speeds depending on materials and application. Has case size range: 15" to 32" long, 10" to 22" wide, 8" to 24" height. Unit equipped with bottom sheet hopper, XL frame, Allen Bradley slc 500 controller, (2) emergency stops heavy duty caster for mobility, lexan gaurding and nordson ct-7 time interval controls. Magazine measures 49"w x 54"l.
Padlocker Model CF 209 XL case erector bottom sealer hot melt is capable of doing from 5 to 15 cases per minute – speeds depending on materials and application. Case size range of: (12" to 30" L) x (12" to 24"W) x (10" to 20"H). Equipped with case magazine, AB PLC, Nordson hot melt system and Lexan guarding. 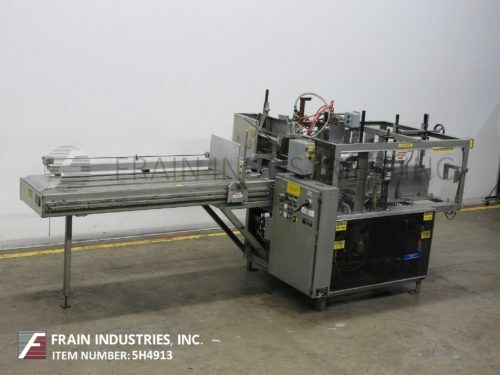 Southern Packaging Model CE900-SCCP, left to right, automatic, case erector, hot melt glue, bottom sealer rated from 1 to 45 cases per minute – depending on materials and application. Case size range: 10 to 24" in Length; 5" to 18" in Width; 6-1/2" to 22" in Depth. Capable of handling a wide variety of RSC and HSC cases with proper change parts. Equipped with 93" long (3) chain automatic blank case magazine, suction cup pick n place, flap plows and closers and is hand crank adjustable with Nordson ProBlue hot melt glue unit and vacuum system and single arm compression ram arm. Control panel has A/B controller, with conveyor, glue, ram on / off, sequence on / off / auto switches and start, stop and e-stop push buttons. Mounted on heavy duty base frame with safety guarding. McDowell Model 201RH, automatic left to right case erector, hot melt glue, bottom sealer rated from 5 to 30 case per minute – depending on materials and application. Case size range: 5-3/4" to 24" in Length 5-3/4" to 24" in Width; 10" to 33" in Depth. Capable of handling HSC and HSC with built in divider, RSC, AFM, FOL and wax coated cartons. Equipped with 28" long blank case magazine that is hand crank adjustable, mechanical recipicating pic n place and case erecting section, hot melt glue unit, with bottom major and minor flap closers and single ram arm compression section with pneumatic height adjustable mast and vacuum pump. Control panel has machine on /off mast up / down start, stop, e-stop controls, with running statis light. Mounted on base frame with leveling legs.